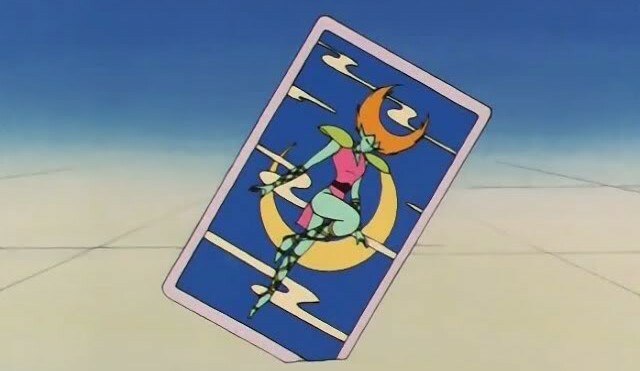 While the whole Monster of the Day (MotD) concept is one of the more memorable aspects of the battles the Sailor Team take part in during their various adventures, it’s easy to forget that this was really more of an invention of the anime than anything else. This is, of course, all doubly true when it comes to the Cardian Arc of Sailor Moon R since… well… there was no corresponding story line in the manga. While in Ms. Takeuchi’s manga, many of the MotD (be they youma, droids, or otherwise) actually went unnamed since they were one-off, throwaway characters, fortunately for us it seems that the anime had a penchant for creatively (generally pun-related) names. As with the youma of the Dark Kingdom, Ail and An’s Cardians don’t disappoint with their names. Let’s take a look at where they came from! 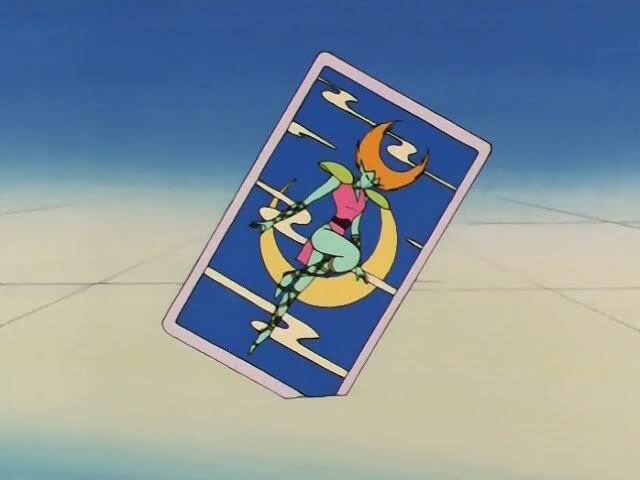 It probably goes without saying, but the name “Cardian” itself is a play off of both “card” and “guardian,” though the idea of them being guardians is a bit ironic when you think about the fact that they exist to help Ail and An steal energy from humans and fight against the Sailor Soldiers. However, it you look at it from Ail and An’s point of view, I suppose you could easily consider them to be guardians of sorts! Individually, though, is where it gets interesting. Vampir: Due to her sucking energy (from our favorite victim, Naru!) for the Doom Tree (Makaiju), it’s pretty obvious that she got her name from the English word “vampire,” though the plant connection seems to just have been added in without any relation to the name. 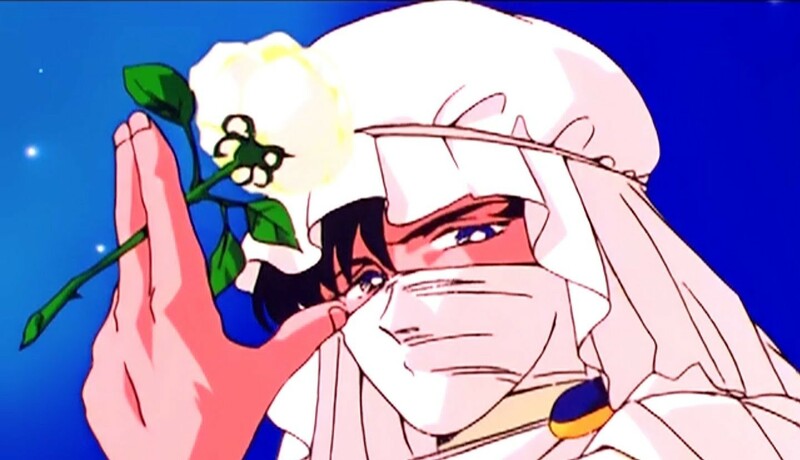 As an interesting bit of trivia, Vampir was voiced by no other than Megumi Ogata, the same voice actress who voiced Haruka Tenoh! Minotauron: Based obviously in both design and abilities on the Minotaur1 of Greek mythology. As for the “~ron” part of the name? This appears to be related to an obscure French term for a cut of beef between the neck and the shoulder, talon.2 You may also recognize this name from Talon, the owner of Lon Lon Ranch3 in Legend of Zelda: Ocarina of Time and beyond. Phalion: You’ll often see the name of this character romanized with an f (rather than a ph), but considering the character’s design appears to be based on that of a sphinx (note that this is not the Sphinx, but a sphinx – a monster in Greek mythology said to be made up of a lion’s body and a female head)4 I think that the beginning part of the name, the “Pha / Fa,” is actually a word play with Pharaoh (which is written similarly in Japanese), hence the spelling. Hell Ant: This is one of those Cardians that, to an English speaker, is pretty straight forward. She’s basically an ant. From hell. Leshy: This is another name that you’re likely to see written differently on the web, usually as “Reci.” The Japanese spelling is an exact match with the Japanese spelling for Leshy,5 a spirit of the woods from Russian fairy tales. Considering the mythological basis for the rest of the characters and that she attacks during cherry blossom season (and from a tree, no less), this seems like a more proper connection. Amaderasu: Continuing our mythological theme, this time the reference goes back into Japanese mythology, as this monster is pretty clearly named after Amaterasu,10 one of the first gods in the Shinto religion and the goddess of the sun. Her name may also be a play off of Amadeus, since they’re spelled so similarly in Japanese. Seiren: This Cardian’s name is a pretty clear connection to the Siren11 of Greek mythology. The sei part of the name, though, may be a pun in reference to the Japanese kanji for “voice” – 声 – which can be read as sei. Utonberino: One of those names that absolutely doesn’t localize well, this is the Japanese word for a traditional boxed lunch, 海苔弁当 (noribentou; nori boxed lunch)12 written backwards. This is obviously where the character design comes from. It’s not exactly apparent in English, but when you break it up as no-ri be-n-to-u and u-to-n-be ri-no, you can see it easier. Bipierrot: Named after pierrot,13 a mime of sorts in traditional French theater and the Japanese word for clown, the connection is pretty obvious. As for where the bi part of the name comes from, my best guess is that it’s the same as the one used in used in Pretty Soldier Sailor Moon (美少女戦士セーラームーン; bishoujo senshi se-ra-mu-n), since bi here means “pretty” or “beautiful” and often is used for female-related words. Yamandakka: While the appearance is obvious – an Asura19 from Buddhist mythology – the basis for her name is a bit of a mystery to me. The best possible answer I’ve been able to come up with is that it’s a play on the Japanese term for Asura which are depicted with three faces and six arms, a design known as 三面六臂 (sanmenroppi).20 If you were to yaman could be an altered reading of 四面 (four faces) and 足花 (legs, flower; read as da and ka respectively). And there you have it! Once again, the various animators, directors, and all the staff who worked on the Sailor Moon anime don’t disappoint when it comes to making creative and interesting character names. Though some of them are a bit obvious to native English speakers, like the Ail, An, and Fiore connections, it’s nice to see all of the different mythologies tied together. And who would have known that a wrestling star would be the inspiration for a character! 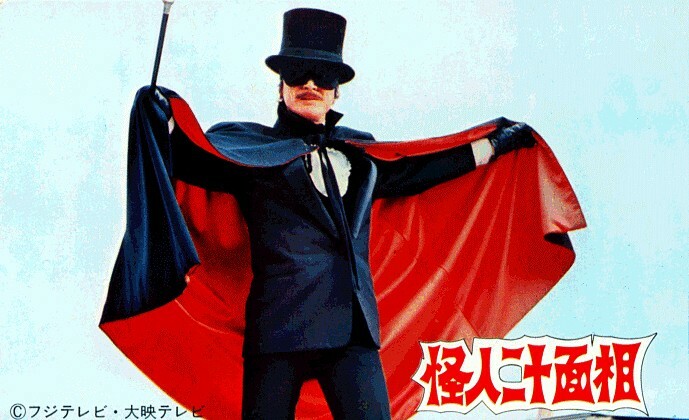 The first time anyone sees the Sailor Moon R movie, I’m pretty sure one of the things to pop into their head is that, you know, the villain of the movie looks an awful lot like those villains, Ail and An, who appeared in the Cardian Arc of the anime. Surprisingly, though, despite the fact that it’s pretty obvious and seems like a consistency issue you’d like to address, absolutely none of the Sailor Soldiers (or even Fiore himself) address this issue. As silly as it sounds, this has been nagging at me for years and I finally decided to take a look into it. 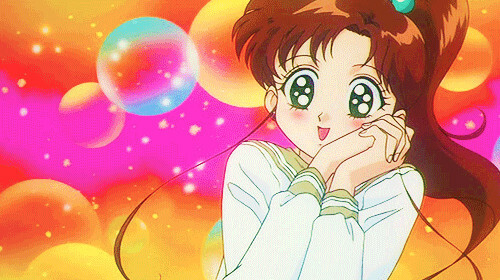 One of the things that makes it much more difficult to use the Sailor Moon anime as a source when trying to pin down its various mysteries is the fact that you can never quite be sure what parts of the story are meant to be canon (i.e., fit into the larger context of the story and “actually happened”) and what events are meant to be side stories. 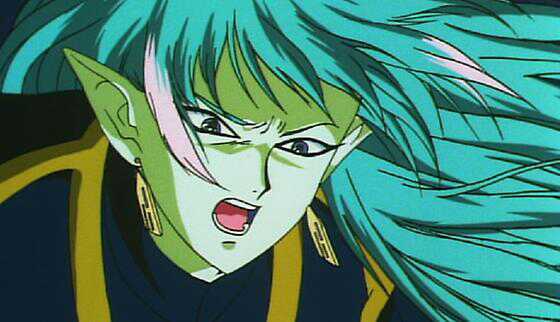 Making matters worse, the anime wasn’t even too concerned about internal consistency for events that were clearly canon, like Sailor Pluto’s death at the end of Sailor Moon S and her casual reappearance in the SuperS movie and in the Stars anime, as if nothing had happened. 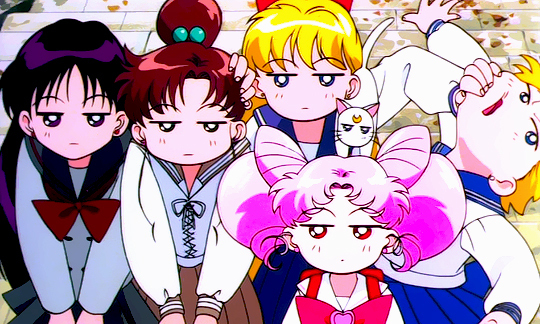 Typically, though, I think it’s safe to say that the Sailor Moon movies are non-canon, especially since the Sailor Team doesn’t seem too particularly concerned with other enemies at the time (the Black Moon Family is never mentioned in the R movie, etc.) and at the beginning of each season and the arrival of the next threat, it seems pretty clear that they haven’t been fighting any other enemies in the mean-time. That said, the Cardian Arc itself could be considered non-canon, which leaves us with a possible double-non-canon interesting plot issue. So after all these years of wondering if they’re from the same planet, if they were siblings, or if maybe all aliens outside of the Sol system looked that way (though this was disproved in Stars), it turns out the answer is really quite simple: the movie is taking the basic premise of the Cardian Arc and is a retelling, using story elements from the Black Moon Family (primarily ChibiUsa’s existence) to flesh out the story. I’m happy to have this mystery finally put to rest, though to be honest a part of me does wish that there was a bit more to the story. I’ve always been a fan of the Cardian Arc and the characters appearing therein, so it would have been nice to see the story expanded upon rather than re-written. But it is good to know that Mr. Ikuhara did address the issue! The Moonlight Night… er.. Knight! 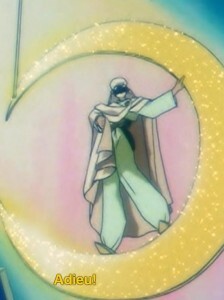 Moonlight Knight is a bit of an oddball character in the Sailor Moon anime, as he’s one of the few “hero” characters that exist only in the anime with no manga connections at all. 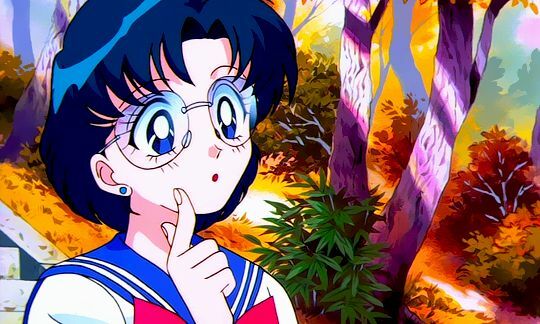 The whole Cardian Arc1 was completely made up for the anime only, supposedly to give Ms. Takeuchi a chance to prepare her next story arc while the anime rushed ahead of her, though I’ve always suspected that the true purpose of this was to give them a sort of teaser for the upcoming Sailor Moon R movie. That, however, is a story for another time. What we’re here to look at is: what’s with Moonlight Knight’s use of French? While I would like to say that there was some sort of deeper meaning to this word choice and over-analyze the issue, I’m afraid that this is pretty much clearly a case of not having done the appropriate cultural research. 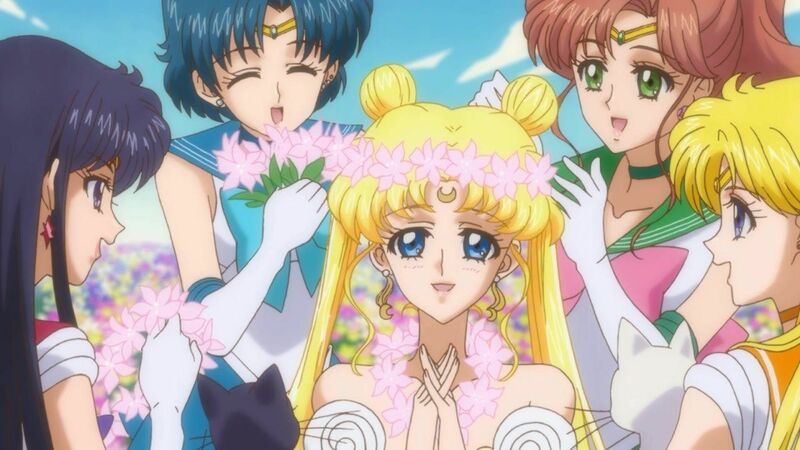 If I were to read into the issue, however, I would say that you could make the assertion that this was Moonlight Knight’s way of expressing that he hoped he and Mamoru would soon re-join (i.e., Mamoru’s physical / human form and his sense of duty to protect the Sailor Soldiers) and was bidding them farewell. Put another way, by implying he would see them again would suggest that Moonlight Knight did not intend to return to Mamoru and resume his activities in the form of Tuxedo Mask. Of course, this is probably looking way too into it, but it’s at least an interesting tidbit, if nothing else! Since Mamoru is a university student in the anime, and many university students are required to learn a second foreign language (other than English), it’s entirely plausible that he did study some French. 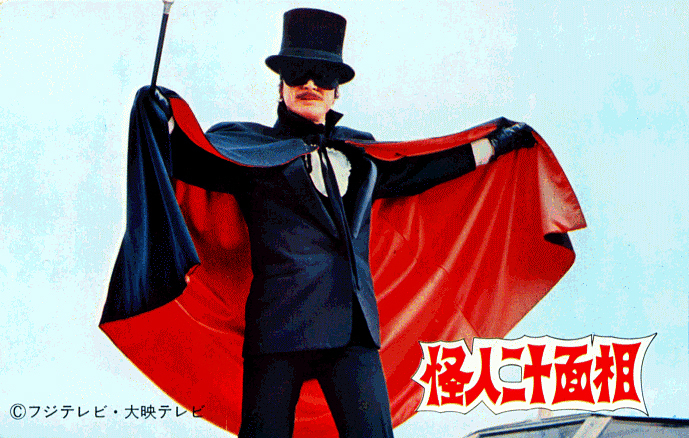 You’re pretty clever, Mamoru!